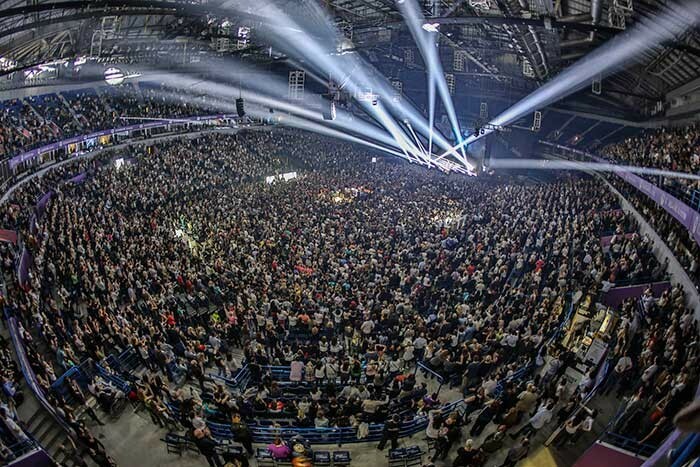 Croatian megastar Gibonni recently played a special concert in the Kombank Arena, Belgrade, Serbia in front of 20,000 fans who all went crazy for the occasion. 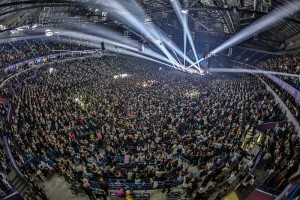 The lighting utilised 22 Robe ROBIN Pointes and 36 LEDBeam 100s which were specified by lighting designer Sven Kučiniċ. Kučiniċ, based in Zagreb, Croatia started working with the hugely popular singer, musician and composer this year. 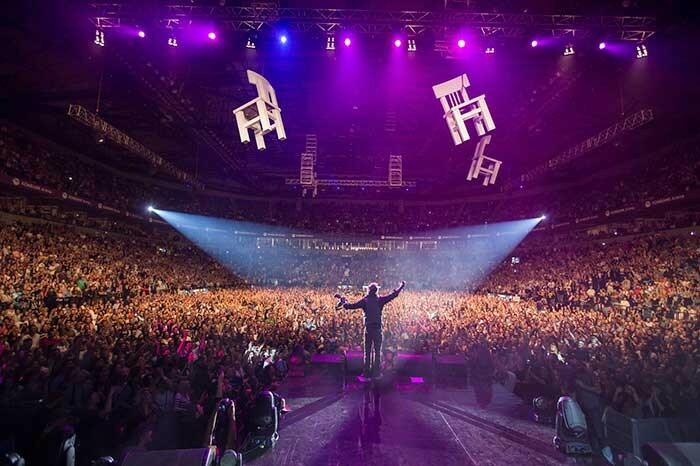 Kučiniċ is a well-known LD in Croatia and was offered the gig following his high profile work with famous Croatian rockers Prljavo Kazaliste plus a plethora of musicals, concerts and events. Gibonni is in the middle of a tour at the moment but this was a special show and saw a much anticipated and awaited performance in Serbia. The starting point for the Belgrade show’s lighting design was to create a rig that looked as awesome as possible with as expedient amount of fixtures as possible; that left maximum room for Scenographer Nevad Stojakovic’s spectacular stage set which resembled a house interior. There was a massive emphasis on visual impact for this show because of its significance and location. The Robe fixtures, together with the rest of the lighting, sound and rigging equipment were delivered by Novi Sad based Studio Berar. The Pointes and the LEDBeam 100s were positioned all around the stage on the floor and used for a fantastic selection of powerful aerial effects, reinforcing the energy and passion of the show: Gibonni’s distinctive blend of sound combines rock, pop and Dalmatian folk music. The Pointes were used as primary beam fixtures and also as spots because of their wide zoom capabilities. Additionally he produced web like scenes with them, taking advantage of the optical system enabling super-tight, highly powerful laser-like beams. The LEDBeam 100s were fitted with frost filters and also utilised as up-lighters to create more dramatic effects when lighting performers from floor level. They were programmed using dynamic Macros to provide further 'eye-candy' for the audience and for some seriously authentic strobe looks. He also received numerous comments along the lines of: ‘Wow – great lasers’ which is a real tribute to the fixture’s incredible optical system. One of the biggest challenges of the whole event was using small and relatively unobtrusive but aesthetically pleasing fixtures on a big stage and in that context the Pointe and the LEDBeam 100 were “ideal choices”. He programmed and operated the show using an M1 console with an M2 for backup. Kučiniċ is also the managing director of LumiLas LLC, a Zagreb based rental and production company specialising in lighting and laser technology and with its own inventory of Robe moving lights. They are currently in the process of transitioning the entire fleet to Robe – such is his commitment to the brand!